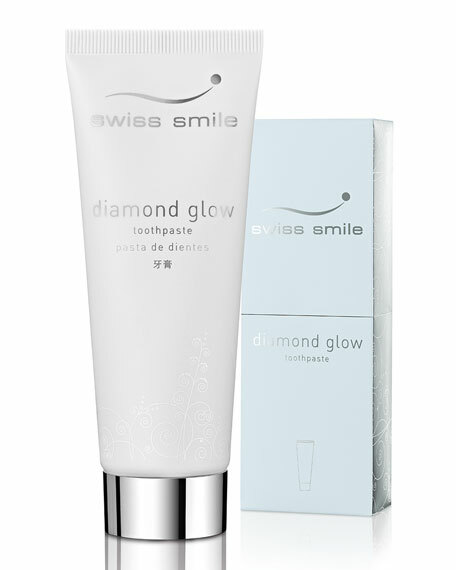 This whitening toothpaste's innovative and precious ingredient combination contains one carat in finest diamond particles for highest standards in tooth cleaning. It cleans softly and evenly, with almost no abrasive effect on the tooth's enamel. Thanks to its extremely low relative dentin abrasivity (RDA), tooth surfaces are gently, yet perceptively whitened and smoothened. Naturally anti-inflammatory curcumin inhibits plaque buildup, thereby reducing caries formation. The formula contains 0% SLS and is enriched with moisturizing, gum-soothing and strengthening aloe vera. Daily use of the brightening toothpaste means gentle all-round dental care for a high-carat dazzling smile and an unprecedented feeling of dental smoothness. Over 1 carat in diamond dust for a uniquely smooth tooth feeling. Whitens teeth and removes tartar while minimally abrasive (0.1 mm if used twice daily over a 70-year period). Naturally antibacterial turmeric oil delays biofilm development. SLS free formula for strong, healthy gums. Apply a hazelnut-sized amount of toothpaste to your toothbrush and hold like a pencil. Position at a 45° angle by placing your thumb on the slanted surfaces of the octagonal handle. In small circular movements half on the gums and half on the tooth gently and carefully clean all of your teeth. Removes superficial stains such as those caused by coffee, tea, tobacco, red wine and leaves teeth glistening and noticeably smoother—without harsh abrasives. The Whitening Toothpaste incorporates the breakthrough science of Calprox®—Supersmile's proprietary form of Calcium Peroxide that is encapsulated with baking soda—with 16 other ingredients to provide superior whitening.